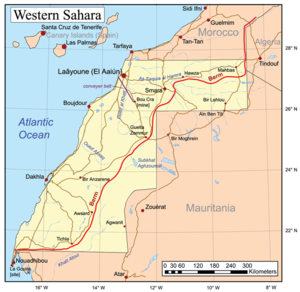 Western Sahara is a mostly Moroccan-controlled territory in Northern Africa. Western Sahara has been on the United Nations list of non-self-governing territories since the 1960s when it was a Spanish colony. When traveling here, you are de-facto traveling on the territory of the kingdom of Morocco, so all visa-issues, police control checkpoints etc. are mostly applying to Morocco. Speaking a little bit of French, Spanish or Arabic will bring you through without problems, though more and more people speak good English due to the presence of the UN. Parts of the east (behind the berm) are controlled by the Polisario Front. Hitchhiking in Western Sahara is very easy along the coastal road N1, where traffic is plentiful as far down south as Dakhla but sometimes sparely as well. All over the territory, from big cities to the most sparsely location, people pop up to hitchhike as well, so the concept is well known and understood. It will be easy for you to catch rides all the way to Mauritania. Locals hitch rides with pointing the forefinger into the driving direction instead of using the thumb. Hitchhiking the N14 to Smara shouldn't be a problem as well, but the other two main roads N3 and N5 can bring problems with them, due to the berm and partly Polisario-controlled areas. Traveling these roads should be taken with a lot of care and it's always best to collect information about the current situation. It can happen that Moroccan police will send you back and not let you through. Also the whole territory is still covered partly with undiscovered landmines, so be extremely careful when leaving the main roads and walking into the desert. Finding long rides can be especially easy with Westerners heading southwards towards Nouakchott and Senegal or Mali and can be done at Camping Moussafir in Dakhla and also Hotel Barbosa about 60 km from the border, where a lot of Moroccans and Westerners stop so that they can reach the border nice and early the next day. If you have made it to that spot chances are good that you have already come there with a Westerner; from Tiznit on resp. Nouakchott in the South, chances are really good to get a lift from an European. Morocco: There actually is no border, just a handful of police checkpoints along the road. Algeria: The border to Algeria is closed, though it could be possible to get into via Polisario-controlled areas, though this is absolutely not advised if you want to travel safely. This page was last edited 16:29, 1 March 2018 by Jeremy lachance. Based on work by different users of the hitchwiki community.